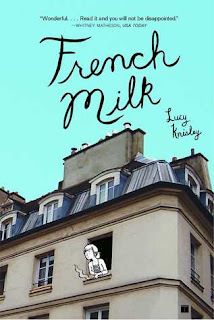 I read French Milk Lucy Knisley during the 24 Hour Read-a-thon when I needed something quick and light. I enjoyed it so much I read it in one sitting. I never read graphic novels. I haven't had much experience with them and most of the ones at the library just didn't appeal to me. French Milk was something different. Lucy was just finishing up her schooling and thinking about the future when she took a trip to Paris with her Mom. And what a trip! They spent 6 weeks exploring Paris with an apartment as their base. They could come and go as they pleased and really marinate in the French culture. I was so jealous. French Milk is the illustrated journal she kept during this trip. They wandered around looking at the sites and art, eating, shopping, sleeping and just enjoying themselves. It wasn't all fun and games though. Lucy couldn't help thinking about her future. She reminded me of myself at 22; a ball of indecision just wanting to get out on my own. (I'm still a ball of indecision.) She has moody moments where she draws manatees all day. I enjoyed this book so much, I want to save my money and take my girl to Paris for a month when she's 22! So I loved my very first graphic novel. I loved the style and the format. I'd like to read more like French Milk. Do you have any recommendations for me? Thanks to my local library for carrying this book! JoAnn- Thanks. I'll see if I can find it. This sounds EXCELLENT! Thanks for the heads up! I've had this on my wish list for a while. A couple of great graphic memoirs are The Shiniest Jewel and Persepolis. yay, another convert :D I'll second JoAnn's recommendation of Ethel & Ernest - beautiful and touching. Also, Maus and Persepolis get recommended all the time, but with good reason. More: American Born Chinese, We Are On Our Own, Fun Home, Death - The High Cost of Living, Castle Waiting, A Contract with God, Lost at Sea, Laika, Heartbreak Soup, Bone...okay, I'll shut up now :P Happy graphic novel reading! Gavin- Thanks, I'll look it up. Kathy- Thanks. I did want Persepolis but the library only has #2. Nymeth- Wow! That is quite a list. She- It was! It was really sweet. Persepolis is a lot darker, but I recommend it. still haven't treaded into the waters that are graphic novels...should this one be my first? why am i so hesitant?!?! I want to read this eventually but the library here doesn't have it. One day I will get to it! If you want graphic novels the best bet is to ILL from the city... That's who seems to have the better ones. I loved, loved this graphic memoir. And I too want to go live in Paris (or somewhere similar) for 6 weeks with my mom. Wish I didn't have to work. I'm going to copy down Nymeth's suggestions. This sounds like a fun comic. Understanding Comics is a nonficiton book about what makes the medium so awesome. Sorry I don't have any light comics to suggest! I hope you enjoy whatever you pick up next, though! Sounds like a great book. I've put this on my TBR list. My library doesn't really have a lot of graphic novels, so I'll probably have to buy this one. Have a great weekend! I thought this must be good as I've had my name on the list at the library for quite some time and I'm still waiting. Your review tells me I should be patient since it is worth it. I added this to my wishlist when Beth Fish reviewed it. I haven't read many graphic novels, but can recommend THE SHINIEST JEWEL which is a graphic memoir about a woman's international adoption of her daughter. I have this one on my list. There have been quite a few good reviews for it lately and I think it would be just the thing to break into graphic novels with.